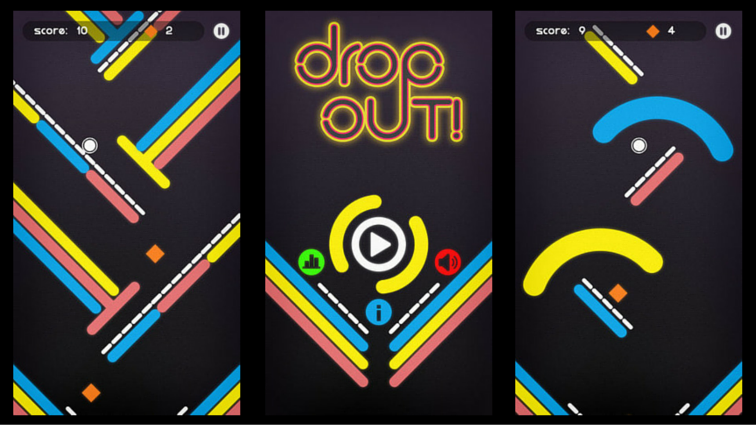 The following four Buildbox games made the Top 50 of All Games in the US Charts, this week: Drop Out! #5, Color Switch #14, Slip Away #34 and Switchy Sides #48. And all of these games were created with our game creation software, which means that 8% of the Top 50 Games were made with Buildbox. It’s really great to see our customers’ games perform so well in the charts. Drop Out! by Blu Market is currently ranked #5. It’s an action strategy game that despite it’s simplicity is extremely challenging. In Drop Out! players must quickly tap on their screen to slow down the pace of their falling ball. The main goal is to keep the ball from colliding with the various moving platforms as it freefalls. Pace and timing is crucial. Drop Out! is available for download on iOS. Color Switch, which was originally created by David Reichelt, in under a week using Buildbox has amassed over 75,000,000 downloads worldwide. At the time of this writing it’s currently ranked #14 of All Games in the US Charts. Color Switch broke previous mobile game records, when it held the No.1 spot on the U.S. charts for 27 days straight beating out Flappy Bird’s 22 day streak. The game has been ranked #1 in 98 different countries since its release. You can learn more about Color Switch’s here. Another game topping the charts is Fabmika Games’ Slip Away. Published by Nanovation, this arcade game has been making waves since its initial launch. The game has hit 1 million downloads in the App Store. Slip Away has also been featured internationally and ranked in the Top 100 charts in Canada, Russia, France, and Germany. It’s currently ranked #34 of All Games in the US Charts. In Slip Away players embark on a unique underwater mission guiding an octopus through the ocean trenches. Players have to maneuver through obstacles while avoiding the various traps that await. Slip Away is available for download on iOS. Published by Tastypill, Switchy Sides was created by Buildbox customer, Alexandru Csiszer. It was his first Buildbox game and since its release it has managed to reach the Top 100 in All Games on the charts. Switchy Sides is currently listed in the Top 50 at #48. It’s also ranked #27 in the arcade and #16 in the US puzzle games category. In the game players have to tap left or right to avoid incoming obstacles. Accuracy and reflex skills are put to the test in Switchy Sides. It’s a fun fast paced challenge. Switchy Sides is also available for download on iOS. It’s always great to see our customers’ games top the charts! You can check out some of the other Buildbox games that are making their mark on the charts in our All-Stars section. Switch Sides’ icon looks almost exactly like Mini Metro’s icon. It annoys me the hell out because I love Mini Metro. Awesome, love build box every moment passes by. Where should i start making games? Shall i start by looking at different tutorials from your site or from youtube or shall i make my own game?